An unexpected side effect of the NHL lockout-shortened season last year with short camps and no preseason games has been the realization many fans and observers of the game simply forgot how much fighting there actually is in preseason hockey. Generally speaking, there’s at least twice as much fighting over regular season hockey and yes, even more than the Rocky/Drago era, or what the pro-fighting crowd occasionally refer to as the "mid-80s". This annual fight for jobs, combined with off-season moves to address transgressions from the year before, always result in declarations of a divisional or conference arms race. Sure the teams involved may ebb and flow but the preseason conversation is omnipresent, as are the stories written early each season on how fighting is out of control in the NHL. The funny thing about fighting isn’t how little it actually matters as games become more important but just how quickly it matters so little. 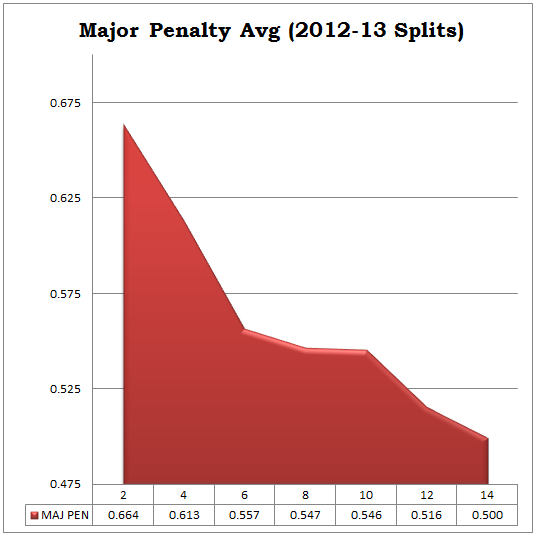 A good way to demonstrate how little it matters is to look at the major penalty rate at 2 week intervals over the course of last season; an excellent proxy given fighting majors only represent about 95% of all major penalties each year. If fighting in the NHL actually served any strategic purpose whatsoever; be it deterrence, getting even enforcing The Code or straight-up intimidation to win hockey games, why does it fizzle out and plateau just over a month into the season and drop off the table a month before the playoffs? The reason for the spike in fights each new season is pretty straight forward; fighters need to justifying their existence to GMs, coaches and teammates. Once that plays itself out, things settle down rather quickly. Even with a full 82 game slate ahead of us, it’s a safe bet the chart this season will still have a huge early spike, mid-season plateau starting by December and a late drop around the trade deadline. For smart teams like the Chicago Blackhawks or Detroit Red Wings, who moved into the Eastern conference over the summer, knowing that fighting ultimately has no impact deciding hockey games or protect stars from cheap-shots allows them to focus on 4th line players with the skill set to play up the lines as needed and/or take 33%+ more shifts. All they need to do is weather the early fight storm and watch other teams waste cap and roster space hording energy players and goons with no such ability to help when, not if injuries hit. And since 250 man games lost to injury is considered a unusually healthy season these days, functional depth ultimately has a far greater payoff than sub-7 minute enforcers, especially in the playoffs. The regular season fight average was 0.48 per game last year, a slight uptick that would have been the 4th straight year of decline had the NHL season been long enough to balance out the annual, early spike. Once the playoffs start, the fighting dries up and the more important the games get, the fewer fights there are. Overall, the fight rate dropped to just 0.17 per game during the 2012-13 playoffs (4 year avg 0.157) with the bulk of the scraps occurring in the first 3 games of Round 1. In the 41 games played after that point, there were only 2 fights, or just 0.048 per game. Get through Game 3 of the 1st Round and playoff hockey became 95% fight free. Needless to say, it's easy to see why the advantage ultimately goes to teams capable of rolling 4 lines the longest, not those short-shifting the bench to cover for their goons. 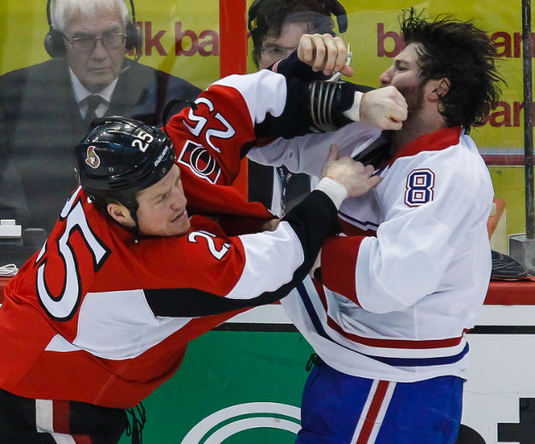 If the NHL stopped their 2-tier justice system on cheap-shots and players stopped fighting over clean body checks, the regular season rate of 1 fight every 2 games would suddenly be closer to 1 every 4 or 5. Sure the pro-fighting crowd may hate it but personally, I enjoy playoff hockey.